No pandemic in history has struck the world in such a frightening way as HIV/AIDS and Sub-Saharan Africa is one of the hardest hit areas. Fact: In Kenya each and every day between 300 and 400 children die of this terrible disease. Fact: 94% of infected persons live in developing nations where drug therapies are largely unaffordable. Fact: Over 13 million African children have been orphaned already through AIDS and this number is predicted to increase as high as 40 million by 2020. Every penny raised for Nyumbani is administered by Rotarians and every penny benefits the children. Nyumbani Home currently provides home and shelter for 135 HIV+ orphans and houses a busy diagnostic laboratory serving the orphanage and the wider Nairobi area. Lea Toto, raising the child, is the outreach programme with the overall goal of mitigating the impact of HIV/AIDS and reducing the risk of HIV transmission through provision of a comprehensive home-based care package, reaching into the slum townships. Nyumbani Village, a self sustaining eco-village in the district of Kitui, has been purpose-built to provide homes and full supporting services for destitute grandparents and their dependent grandchildren, the infected and the affected. This eco village continues to develop its infrastructure with the inclusion of primary and secondary schools, a polytechnic, a clinic, a farm and now includes a voluntourism block thus raising more revenue through paying volunteers. How can Rotarians and Friends help? 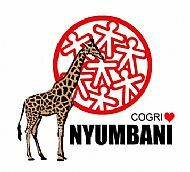 As a small charity, COGRI Nyumbani will appreciate whatever help you can offer. * Include Nyumbani in your fundraising (coffee morning, marathon, climb a mountain, quiz night, golf day, African-themed dinner etc) - the orphanage, the outreach programmes and the village are funded totally by donation. * Volunteer your help in Kenya for a couple of weeks - Rotarians organise work parties yearly or even twice yearly. Participants are able to share their diverse skills and at the same time enjoy an unforgettable experience. * Sponsor a child's education for a year. School is free up to age twelve. Secondary and tertiary education requires fundraising. * Sponsor a nurse or a teacher for a year. Nyumbani employs nursing staff in all three areas of care, paid for by donation. Nyumbani village primary and secondary school teachers are like funded.